What do you get when you mix a lifelong addiction to needle and thread, an inability to follow directions and a love of creating? In Sue’s case that landed her a career in quilting. From her humble beginnings purchasing her first quilt frame when she was 18 and didn’t know a thing about quilting to her most recent foray into modern quilting and the use of embroidery, beading, shaving cream, paint, black sharpies and inks! You’ll be inspired to take on those goals you’ve always thought were just beyond reach. 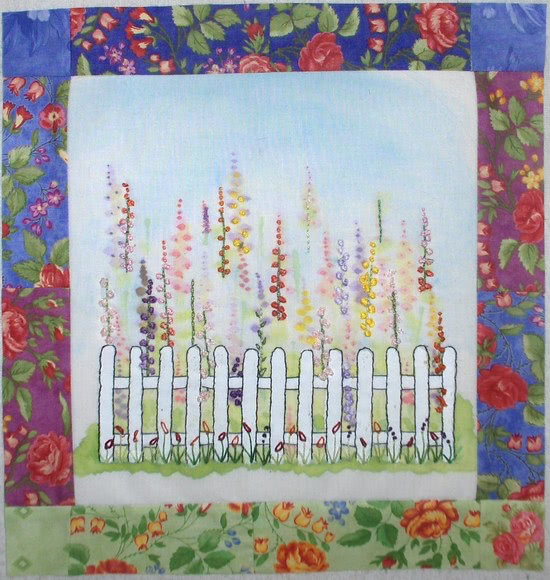 Sue will share her quilting journey and how she became a published quilt designer! Thank you so much Michele for giving me the opportunity to share my journey with your readers! It’s still hard to believe that I’m living my passion every day! I grew up with creative parents, who were firm believers that we all needed to have a hobby. I think it was a way to keep us children (4 in total) out of their hair! But I’m very grateful that they instilled in us this love of creating! As a child, it was Dad who would go out Christmas Eve to our local hobby shop and purchase a gift for each of us that would keep us busy for the remainder of the Christmas holidays! It was in those early days working on my projects that started my love of creating. It became a tradition in our family that you had to make everyone’s gift for Christmas. It all began in June, the sneaking around, do not enter signs on the doors, items stuffed in closets, small bags from the hobby shop, orders from Mary Maxim catalogue! Christmas was very exciting time for us with the anticipation when the surprises were unveiled! It was just as much fun planning and creating each gift as it was to receive it! So for us Christmas started in June and lasted until December. It took a lot of thinking to make the right gift for each of our family members. We were not allowed to go out and purchase a gift; it had to be made by our own hand. My mum would sew, my dad would be in his wood shop, my brothers would be carving, my sister was painting and I…..well I did a little of everything! My husband and I continue this tradition with our own children today! I remember when the Mary Maxim Catalogue arrived at our home drooling over everything they had and always found the quilting section totally fascinating. No one in our family quilted, in fact, I didn’t know anyone who quilted growing up. But with my first paycheque I purchased a floor model quilt frame! I was so excited when it arrived. I had no what to do with it, but I thought to myself, one day this will come in handy! Well, different jobs, back to college, moving from Ontario to BC, marriage, and children, fast forward 32 years with my quilt frame following me, I finally met a very dear friend who showed me how to quilt and I was hooked! I was so excited to find quilting shows on TV. I thought I was in heaven. I joined a guild, purchased fabric, of course only fat quarters, but with those I made my own designs. It was from there and 12 patterns later, I went to Quilt Market in Houston Texas. Here I am in my booth along with 2500 yes, 2,500 other pattern designers, publishers, fabric designers that I was approached by Northcott Fabrics. They asked if I would design with their fabrics and I said "Sure" (there is the word again! It has been three years now working with Northcott and they are a pleasure to work with! Now I’m part of the editorial team of the first National Canadian Quilting Magazine "Quilter’s Connection" available in Chapters. We decided to do a retreat once a year for our readers. We have so much fun and this gives us an opportunity to meet our readers from all across Canada. I enjoy learning new techniques. When I have some playtime in the studio, when my deadlines are met, I play with inks, paints and hand embroidery on fabric. 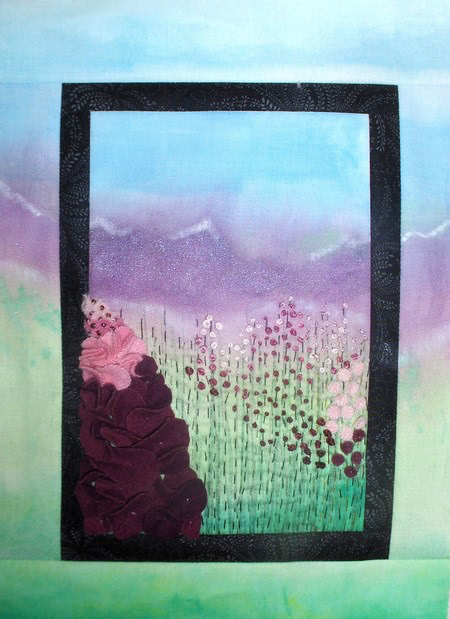 I love gardens and this is my hollyhock interpretation. I also like using wool appliqué and beads, so here is another playtime experiment! 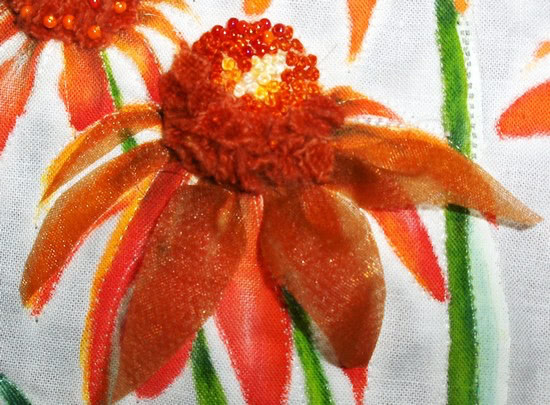 Then, it was a little of organza, wool, embroider, inks and beading. I call this "Ditch the Rules" Just play and let your imagination soar! So you see, I love to play and I’m always looking at all mediums and ask myself, "How can I incorporate that technique into what I do?" It’s amazing what you can create! My next goal would to write a book on "Ditch the Rules" encouraging quilters to play, trying techniques that would enhance their quilting journey! Do you have a "Ditch the Rules" technique? Let me know, I would love to post them on my blog! If you e-mail me your "Ditch the Rules" technique, you could win a free pattern from my website! Visit: Quilted Escapes. Great interview! That is so neat that your parents wanted each child to learn a craft. I always have a hard time understanding people who are “bored” as I’ve always done crafts. I enjoyed reading this interview very much. I too end up discarding patterns and directions and doing my own thing. I do use them as a guide but I am so impatient to begin my project that it is hard for me to read all of the little details. Looking forward to doing your log cabin quilt at the retreat. So interesting to read your bio. Cheers!